Described as “the story of our founder’s ambitious journey to America in pursuit of his dream: to brew the King of Beers,” this cinematic Super Bowl commercial drew criticism from certain folks for a perceived pro-immigrant bias, especially given that it was released around the same time the president issued an executive order regarding immigration. The hashtag #boycottbudwiser (sic) started circulating before the commercial even aired. The biggest complaint was that ad was tone-deaf in how it co-opped imagery from Black Lives Matter and other earnest political movements. The thinking that beautiful people drinking sugary beverages will solve the world’s problems is also flawed. In any event, “Live For Now” didn’t live for long. 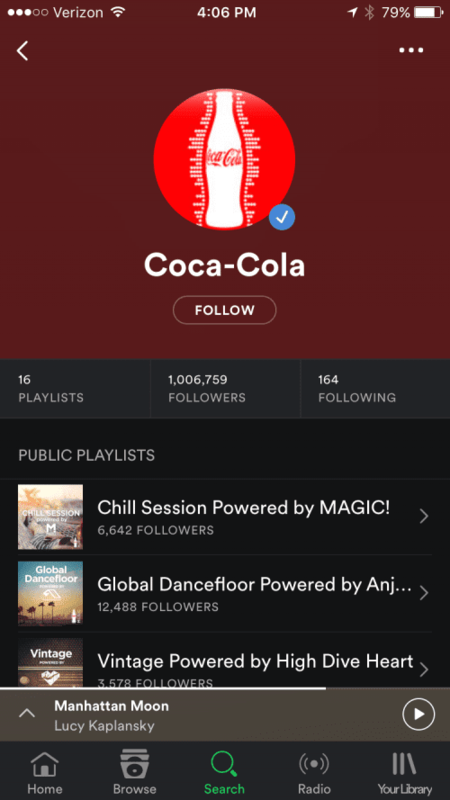 Pepsi wisely yanked the ad a day after its release. OK, so, if we take the lessons learned from both Budweiser and Pepsi, the message seems to be: Stay away from topical material to avoid ridicule and boycotts. But then along comes Heineken with this ad that takes a huge risk and somehow manages to pull it off. Tapping into a nation’s divisions to sell fizzy beverages isn’t necessarily groundbreaking. Coke may have done it first with “I’d Like to Teach the World to Sing (In Perfect Harmony)” way back in 1971. Horribly cheesy? Yes. A cynical attempt to use flower children to sell soda? Yeah, probably. Offensive? Well, I didn’t see anyone in riot gear, so not really. Actually, the jingle was so successful that it was reworked into a full length song and became a hit on the Billboard charts. I’m going to end this by recalling an earlier BEC post from 2016 regarding ethics in marketing. In that post, we outlined a few steps on how to be ethical in marketing: Do the research, Be objective, Be the good, and Get better. We can also cull one other lesson in marketing the Heineken ad: Take the time to get it right. This is doubly true if you’re using a societal issue to spread specific message. Every now and then, you meet a healthcare provider that you would follow to a new location…or perhaps on social media. Vancil Vision Care is, for me, one of those places. 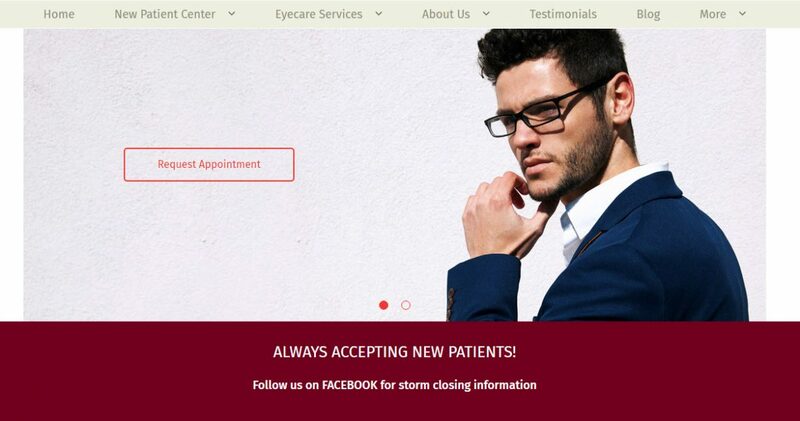 Not only am I a fan of their services as a patient, but as a marketer I definitely admire their online presence. A few years ago, I needed some new contacts, but didn’t want to drive all the way to Bangor for an eye doctor appointment, so naturally I turned to the internet for some help with researching a new optometrist. Thanks to Google, I discovered that the optometrist my dad used to see in Bangor had moved to Bucksport. For those of you who don’t know me, I am not typically a fan of talking on the phone. Online scheduling is a dream come true for me, but websites often trick me with “Make a Reservation” buttons that simply lead to a phone number. When I saw this “Request Appointment” button, I was skeptical. However, I’m pleased to say that you are actually redirected to a contact form that lets you fill out your contact information, top three appointment choices, and what the nature of your appointment is. Also, in the red banner area, they tell you exactly where to go for storm closing information: Facebook. This indicates consistency in where they have chosen to post, and that they are on top of communicating with their patients. The follow up also came via email (I guess they assume that if you’re initiating contact online, that’s your preferred method of communication). However, they will call a couple days before your appointment to confirm. In their website’s footer, they’ve included three content areas: Services, Make an Appointment, and Online Forms. The Online Forms was another selling point for me- all those forms that they usually make you fill out at the beginning of an appointment with a new doctor are available to fill out online, which cuts down on the time you have to spend in the waiting area. If you’re wary about sending sensitive information online (which, let’s face it, you should be), the “Online Forms” section will take you to a secure third party website which encrypts your information with 256-bit encryption keys (found on the fine print at the bottom of the page). If you still aren’t comfortable, you can just print out the forms and bring them in when you come for your appointment. Their email marketing is also well constructed. I will usually only hear from them a handful of times throughout the year, there is always a purpose behind them, such as a limited discount, a reminder, etc. The image below came from one of these messages. 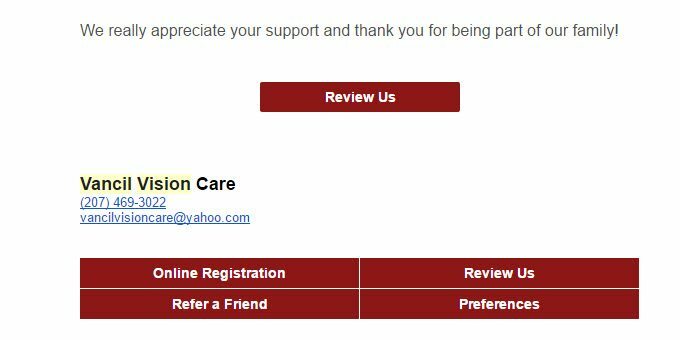 Their main call to action is above the email signature, “Review Us,” but there are other actions below that you can choose as well. However, their follow-up after an appointment template is a little bit different. Instead of “Review Us,” they have “Provide Feedback,” which is a quick survey about the overall experience. People are more likely to “Provide Feedback” following an appointment, so this is probably the best placement for that call to action. In addition to smart and thoughtful email marketing, Vancil Vision Care has a pretty amazing Facebook presence as well. Not only do they post storm closing information, they have interesting/useful eye facts, featured products (like lenses), and a lot of fun posts like this one below. Initially, you may not think of vision care or optometry as an industry that can thrive in social media or online marketing. However, Vancil Vision Care has proven that if you’re thoughtful about your customer and have a sense of humor, there’s no reason why you can’t rock your online presence. Working for a small business that attracts some amazing clients, I’ve never run into a situation where I’m asked to carry out a task or promote something that I’m morally opposed to (and, I have the freedom to politely turn down such a project). It’s a freedom I often take for granted, until I hear stories about people who don’t necessarily have such freedom. A couple weeks ago, I was listening to a podcast (Real Talk Radio with Nicole Antoinette) where a woman was being interviewed about her blog (Super Strength Health). Part of the podcast that I found intriguing was towards the end, when she spoke about being approached by various brands to promote their product (a fairly common occurrence for lifestyle bloggers). Usually when this happens, the brand has done a bit of research to determine if the blog’s message meshes well with the brand’s message. As a bit of background, Super Strength Health shares very raw material about eating disorder recovery. The brand that approached her had a tagline along the lines of “guilt-free snacking.” You might see the problem here. So, the blogger was a bit frustrated. “If you spent any time on my blog, you’d know that we were not a good fit.” Which is true. The discussion goes on to discuss the slippery slope of assigning guilt to food/eating in marketing, and whether or not that is unethical. Regardless of where you or I stand on that particular issue, it made me wonder about the messages I’m putting out there. How can I be ethical (or more ethical) in what I produce? As mentioned before, I have the freedom to turn something down if I feel it is unethical or immoral. We never really get those clients. Usually when I think “unethical marketing,” it’s the blatantly obvious not-cool marketing, like promoting unhealthy habits, tearing down a competitor’s product or service instead of focusing on why your product/service is valuable, or ignoring glaring flaws or safety concerns with a product (think recalls). These are all easy for me to avoid (in that I’ve never encountered them). Do the Research. Make sure you know your facts, especially if others are coming to you for information. Be Objective. Do you really think this product/service would benefit other people, or do you maybe have dollar signs in your eyes? “Is this Something I Would Do?” If you’re having a hard time being objective with the facts, ask yourself if you would follow your own advice. Be the Good. This is my way of remembering my bottom line: whatever I put into the internet/world should make it a little better, even if in a small way. Get Better. There’s always room for improvement, and as someone who produces content for the internet I could in theory find a rhythm and rest on my laurels. But I could also keep an open mind and look for ways to improve my work (because this isn’t just about me). My hope is that following these five points in a more thoughtful way will help me feel even better about what I produce, and be more helpful for our clients. (I say ‘more thoughtful way’ because I usually perform research or try to be objective, but it can be reflexive). The cool thing about marketing ethics? Marketing Schools defines it as “less of a marketing strategy and more of a philosophy that informs all marketing efforts.” It’s not a strategy or a game-plan, but more like having a Jiminy Cricket on your shoulder asking if you believe in the message you’re about to share with the world.